I'm a drainer. I like to open the can, inspect the oil, then, holding the fish gently in the can, drain off the oils. I don't need it dripping it's way to the cracker. And I'm still trying Fancy Spanish Fish. Tonight's Tin: Matiz Gallego. Are you kidding? I got these at Whole Paycheck. This particular store, 4th and Harrison, SF, has an amazing beer selection. I grabbed a few singles, and ended up complementing the dept. mgr. He took great pride, so I asked him about the TG. He talked about communicating with the breweries direct and hooking them up with distributors just to get their beer. I said I'd check back. Our Matiz Gallego sardines are harvested off the coast of Galicia, known for its exceptional seafood. Traditional methods are used that respect the biological cycles of the species, as well as avoiding harm to other sea creatures. Lights are used to attract schools of sardines to the surface, where small nets await to bring them aboard the fishing vessel. Once harvested, the sardines are prepared by hand using old master cannery know-how and then packed with the highest quality ingredients to produce a sardine that is moist, tender, and uncommonly flavorful. Four out of Five Tins. 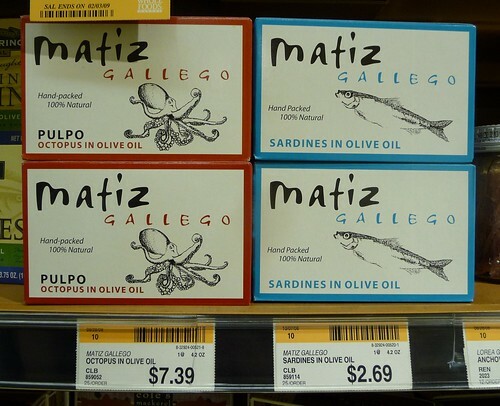 And of course, on the shelf right next to the sardines, the only other Matiz product, was the Pulpo. Visually perfect, amazing texture, but the flavor was quite lacking. The Albo was much better. Two out of Five for flavor, but texture and presentation makes it Three out of Five Tins. Pliny the Elder was a Roman naturalist, scholar, historian, traveler, officer, and writer. Although not considered his most important work, Pliny and his contemporaries created the botanical name for hops, "Lupus salictarius", meaning wolf among scrubs." Hops at that time grew wild among willows, much like a wolf in the forest. Later the current botanical name, Humulus lupulus, was adopted. Pliny died in 79 AD while observing the eruption of Mount Vesuvius. He was immortalized by his nephew, Pliny the Younger, who continued his uncle's legacy by documenting much of what he observed during the eruption of Mount Vesuvius. 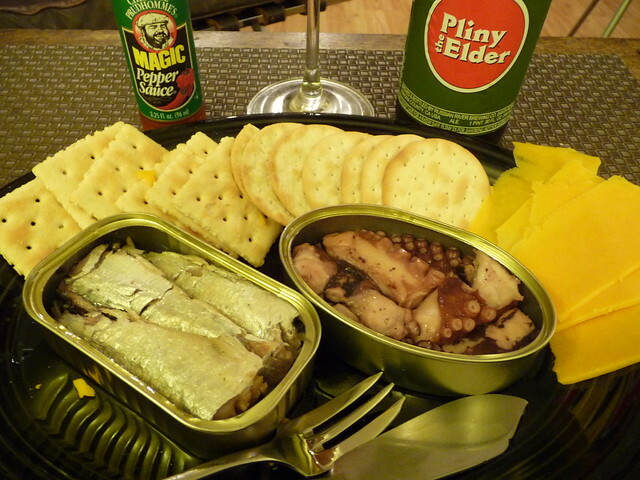 The fish look delish and I'm gonna have to give ol' Pliny a try. 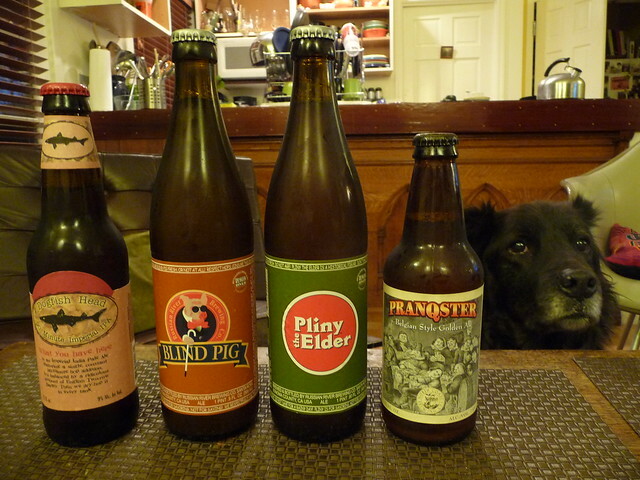 I got that Pliny on draft at the Belmont this fall. Lovely stuff. Which Dogfish was that? I tried the 60 minute IPA, but was not as blown away as I had hoped. have no intention if increasing production to meet demand. A pity, since it has conquered it's class. You'll just have to come to Portland (or Boise) to get more. Also, I have seen those Fish for $7 at Zupan, and haven't taken the plunge. The Dogfish Head looks like the 90 minute IPA FYI. Oh I love you...Whole paycheck witticism! I too LOVE sardine tins. Recently saw some in Paris, had to strap my hands together to stop me from buying..the packaging!